Hi to all the Story Empire readers! Our second Friday of each month is dedicated to a book one of use shares with a bit of reasoning behind the choice. This is a very subjective process but one which we all look forward to posting because we get to share what we like in books and readers get to learn (hopefully) about an author/book they may not have previously read. 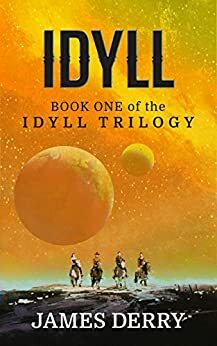 This week, I’ve chosen Idyll by James Derry, which is the first book of his science fiction series, The Idyll Trilogy. James combines quite a lot of elements into this series beginning with this book. I’ve included it today because it is very original in presentation of some highly intriguing science fiction while reading like a western.